The William Morris | Pub Quizzers | Find a pub quiz near you, now. Pub quizzes take place at The William Morris, Colliers Wood on Mondays (weekly) at 19:30. Entry is £0.00, you can have up to 10 people on a team. There are prizes of drinks, food. Happy quizzing! 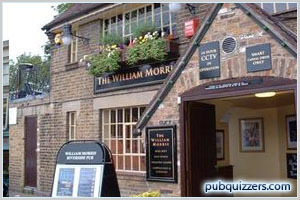 Go and play the Willmo Quiz at The William Morris, Merton, SW19 every Wednesday. Top Prize £30 bar tab and chance to win the cash accumulator. See @WILLMORRISSW19 for more details. What is paresthesia better known as?